When I left Mali I realized that with less than $6,000 that I managed to raise, we completed the following: 1) The development of a local enterprise manufacturing solar panels and cookers locally 2) The completion of 7 locally constructed panels 3) The installation of two of the locally made panels in Banco that powered 6 lights and a solar pump and 4) The construction of 6 solar cookers. We could not help but be proud that such a small amount of money involved in this project is in stark contrast to the hundreds of thousands of dollars that characterize most development projects. Two of the primary objectives of the solar project were to develop means for Malians to generate income through small business and to improve rural women’s condition in a country where women are compelled to spend 4-5 hours each day collecting water and firewood for cooking. Loriana Dembélé finds funds to support projects such as the one above. The machine in the above picture is called a multi-functional platform. 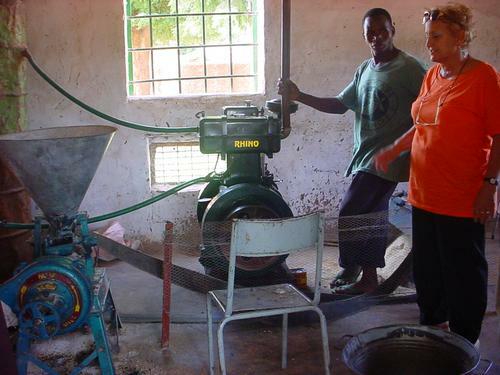 A group of women in the village of Sikasso paid Ji Duma through a micro-loan system and now own the machine. They use it to shell grains, thus saving them hours of hard labor. The women own the machine and generate income as other villagers must pay them in order to use the machine. Ji Duma has done a variety of development work in the villages over the past 20 years, including micro-enterprise development. Therefore, they are a perfect candidate to help spread productive uses of PV throughout Mali. Ji Duma will be the enterprise's first, essential customer! Ji Duma will buy locally produced panels from the new micro-enterprise, Afriq-Power. Ji Duma will then implement and spread the solar technology within the villages. They will be able to train villagers how to use PVs in order to generate income. Ji Duma will be the micro-enterprises's customer and support center. The micro-enterprise will have a much greater chance of being stable and successful as a result. Two locally produced 35 watt solar panels take in the sun!!!! !